The appeal of an Irish Restaurant and Bar is usually its laid-back casual atmosphere. Don’t feel like getting super dressed up to enjoy your beer? Just want to relax and unwind with a nice cold one? Skip the fancy places and find your local Irish Restaurant and Bar – most of which are family friendly. 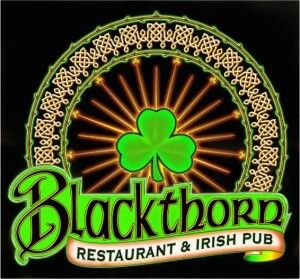 This is what I thought I’d be getting into one Saturday night at The Blackthorn in Kenilworth. I didn’t dress up too nice – just jeans and a decent clean shirt. But when I showed up I wasn’t quite sure where I was. The bar is located on Route 22… so right away that eludes to the fact that it’s probably not that classy. When we showed up they had an outside balcony… huh? The balcony would’ve been nice and appropriate if we were at the Jersey Shore, but it seemed a little out of place when there are cars zooming at 80 mph not even a block away. The people out there seemed to be having more fun than those inside, but there’s something about a cloudy night and chance of rain that tells me that balcony should’ve been closed. Inside was a VERY mixed crowd. The crowd of 20 and 30 somethings were clearly all there to have a good time but nobody looked like they were going to the same place. You had your club bunnies… girls who got “dressed up” in tube tops and skirts to go to the bar, dance and perhaps even go home with someone. Then there were guys in with jackets and ties – on a Saturday evening. Next you have your “white tee” crowd. Guys who throw on a plain Hanes shirt, jeans and fitted cap, and look more like they’re going to summer school than a night out. To add to the mix there were a couple of decent looking people that looked like they would’ve been going to a nice upscale club in Manhattan…what where they doing there? The bar itself was gorgeous. Despite some of the riff-raff that managed to wander into it the place was very well kept and like any Irish bar, offered a decent assortment of drinks. On tap they provided Guinness Stout, Sam Adams, Stella Artois, Bud Light, Amstel Light, Fosters, Yuengling, Harp, Coors Light, Michelob Ultra. Their bottled varieties included Budweiser Select, Rolling Rock, Corona, Corona Light, Amstel Light, Smirnoff Ice, Magners, Heineken, Heineken Light, Bud Light, Budweiser, Becks, Miller Lite, O’Douls and Miller Genuine. Would I try it again? Possibly, if coerced. But I wouldn’t make a special effort to go out there again.